Southampton Airport has just experienced its busiest July in seven years. An impressive 192,353 passengers travelled through the airport in July 2014 – a 1.9% increase on July last year and the largest number since 2007. 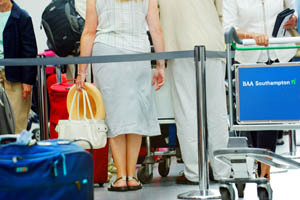 Passengers flocked to the airport to fly to sun-drenched destinations in Spain, Portugal, France and Italy, despite the glorious weather in the UK. The top five summer sun routes were Malaga, Alicante, Palma, Faro and Bergerac – which were most popular with families departing in the school holidays. Passengers have also been enjoying city breaks, with the top short break destinations being Edinburgh, Glasgow, Dublin, Amsterdam and Paris. Flights to Guernsey also proved to be extremely popular, with over 5,000 more passengers flying there compared to July 2013. Flybe’s popular summer sun routes from Southampton to Alicante, Malaga and Faro have been extended to operate through to early November to accommodate half-term travel. Flights to Alicante and Malaga will also now continue throughout the winter from Southampton. The airport is now gearing up for a busy autumn, with new flights to Hamburg and additional services to Leeds Bradford and Aberdeen starting at the end of October. Another sign of how the local economy is picking up. There were some ambitious projections for increased passenger numbers made in 2008 which was supposed to drive local jobs growth but these never materialised due to the recession – now things look like they are picking up again. Of course increased passenger activity brings a downside as a byproduct of increased traffic movements but at the moment most people will consider it a worthwhile trade off for a boost to local GDP. Nevertheless during the recession the airport has been important to Eastleigh – I have attached a radio package I did earlier in the year at the airport and Eastleigh College.